Activate and configure the SNMP service in Windows (more info). 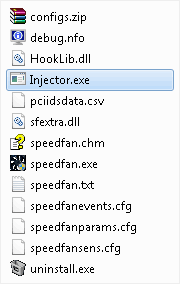 Install SFSNMP and make sure you run the injector.exe to start SpeedFan. Don’t forget to check if the firewall is open for SNMP. 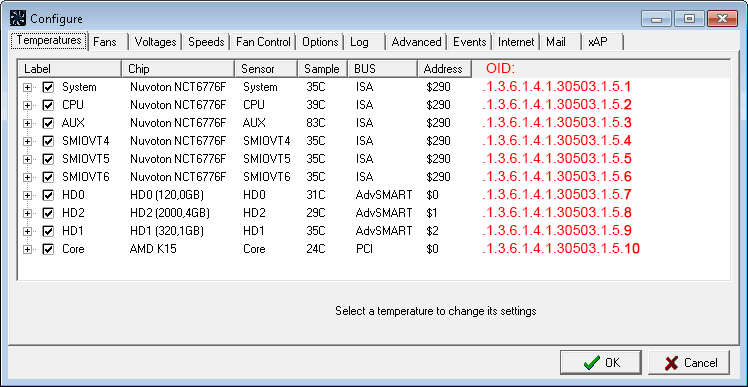 The OID for the Temperature starts with .1.3.6.1.4.1.30503.1.5.1 where every extra line in the above screen is +1, this is the same with the Fans and Voltages. Maybe this will be helpfull for you..
Did you have any luck finding that MIB file? Probably not documented or extinct I guess. Followed every step but I still don’t see any OID information in the configure tab? The OID information will not show up in the configuration tab, I just photoshopped the OID’s in the screenshot just to show what the OID’s will be. Since update windows10 1809 snmp does not work give any OID on none of my computers. I’ve removed and reinstalled speedfan and SFSNMP. SNMP gives response but no reaction when I aks for OID’s 1.3.6.1.4.1.30503.1.5.x etc. I tried to install everything, but I can not get anything even using snmpwalk. I have win7 ultimate edidion. I installed the SpeedFan and SFSNMP,but I not recevi any trap SNMP. I try with SnmpWalk, but nothing. I use Win7 ultimate edition.